Summit Sweeping & Asphalt Maintenance, LLC, has been in operation serving the Roaring Fork Valley and surrounding areas since 1991. My wife and I have owned the business and we are proud members of the Better Business Bureau. I take a total-care approach to help maintain my customer’s property, whether it is driveways or commercial lots, by providing services that are convenient and worry-free. We assess the condition of your surface and create customized maintenance programs that fit your needs including: power sweeping; crack filling; seal coating; line striping; power washing; asphalt repair; snow plowing; sanding; and supplying and installing wheel stops, speed bumps and signs. 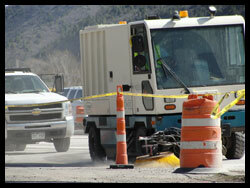 Why Summit Sweeping and Asphalt Maintenance? Educate customers by explaining the root of their parking lot and driveway problems, giving them real ways to solve them, and allowing the customer to make the right decisions.